A Victorian inner-city church destroyed by German bombing. Designed by the Birmingham practice of Osborn & Reading unusually in Perpendicular style, St Catherine's stood in Scholefield Street, a street removed in the 1960s. The site is approximately where Oliver Street now joins Bloomsbury Street. 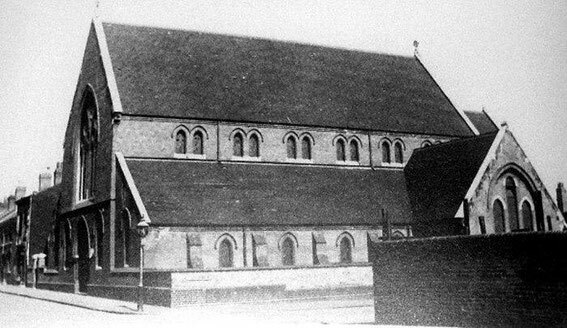 The building consisted of a nave, aisles and transepts and was consecrated in 1878 with a parish assigned out of that of St Clement's, Nechells one year later. The church was closed in 1945, having been destroyed by German bombs, and the benefice was united in 1951 with that of St Matthew, Duddeston. The ruin of the church was subsequently demolished.